Some days ago my book “Kalifornische Kistenkunst” was published. 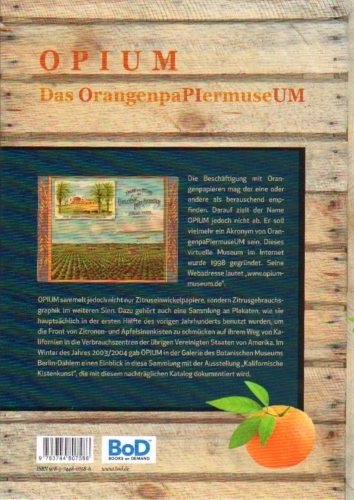 It is a late, but considerably supplemented catalogue of an exhibition of same name held back in winter 2003/2004 in the gallery of the famous Botanical Museum in Berlin. 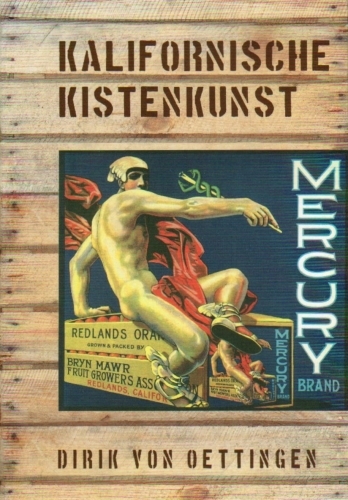 “Kalifornische Kistenkunst” translates into “Californian Crate Art”. Thirty frames with citrus fruit labels and another six frames with labels of table grapes, asparagus, apples and pears, all from California, were presented. All these frames are carefully depicted on each right hand side of the book. On the left hand side one can find the typographic details of the labels presented and a number of additional labels fitting into the motif or the “idea” of the respective frame, but not shown on the walls in Berlin. All more than 400 labels depicted are from my collection. Sure, the text is in German. But that does not affect the beauty of the labels shown. The typographic details can be understood anyway. And the brief introduction is a good occasion to brush up ones German.